We've always provided our complete software suite to all customers who simply purchased an ErgVideo. Historically we've just provided everyone the updates too, and we're still committed to that. It's just that, in the past, the ErgVideo software platform didn't do anything at all without a purchased ErgVideo. Now, we've added a ton of new functionality so you can ride your power files from almost any source, for free, using the ErgVideo platform! 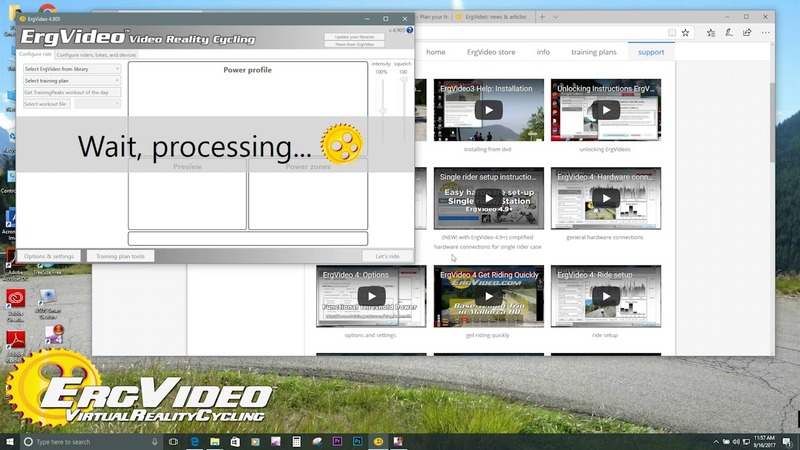 Load your power vs. time files into ErgVideo (it accepts .fit, .erg and .mrc), configure your equipment, and get riding. Don't have any power workout files? No problem, we supply a large library of sessions to get you started! 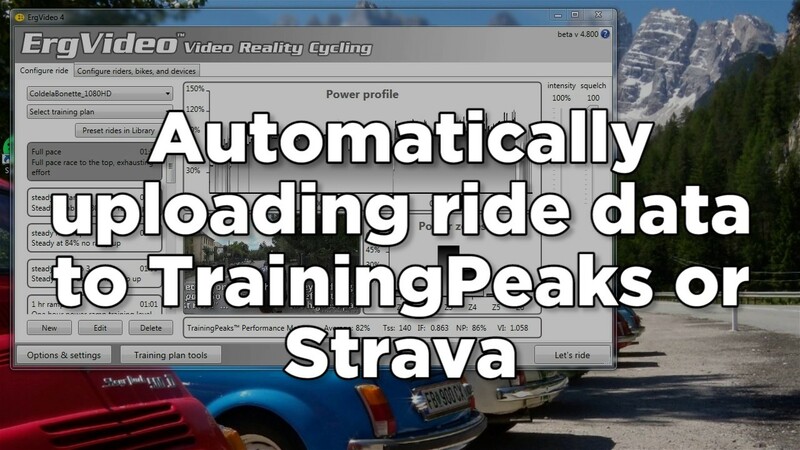 When you are done, upload your performance data to TrainingPeaks or Strava....or BOTH! ...and now we've added free training plans you can ride for free with ErgVideo. Our traditional training plans were decidedly ErgVideo-centric: you purchased a library of ErgVideos and the planner tool sequenced your daily sessions according to any of several choices of preset plans. Each ride was with an ErgVideo. Our "free-mode" plans are built from all free workouts, and can be followed COMPETELY FOR FREE using the software. For each session, we provide several alternative sessions that use some of our more than 125 ErgVideo editions. If you have a susbcription you can choose the richer ErgVideo experience. Plenty of people are paying a monthly subscription fee, or a one-time purchase price for a platform with which to ride their power files. ErgVideo does all the same stuff, for free, and supports up to 24 riders, riding together. Still other people load their power sessions onto their garmins to control their training. Let's face it, that's a small-screen-world-of-despair-and-loneliness, and you're often on-edge about what's going to happen next. ErgVideo provides simple yet complete visuals to let you watch your workout progress, prepare for the best and worst, and every now and then we send you some eye-candy that you'll be looking forward to. It lets you synchronize your session with training partners, and you can ride together, suffering and recovering all at the same time. 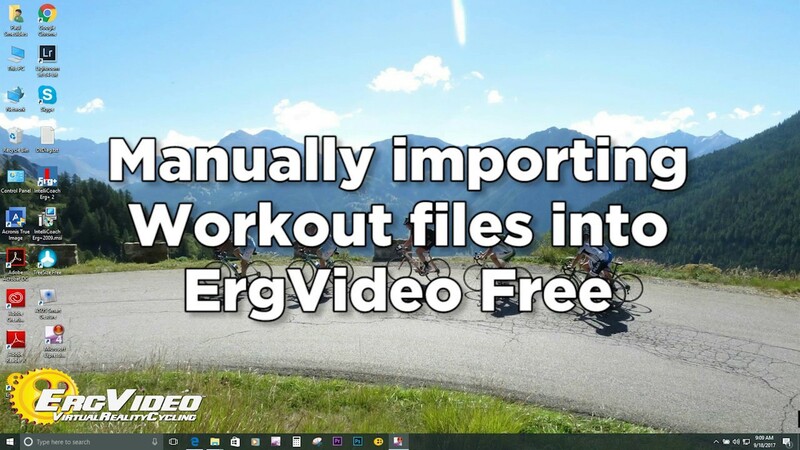 ErgVideo will load your TrainingPeaks "workout of the day", too! More and more, people have TrainingPeaks coaches providing daily workout sessions using their new planning tools and workout builder. ErgVideo can directly connect and load your daily power workouts with the click of a button. Watch our instructional videos to see just how fast and easy it is. it's the same software as the paying customers, with no restrictions! We think life is too short and our company of one is too stretched thin to maintain two separate software streams. Hey, ain't nobody got time for that! You can ride up to 24 riders, on any mix of the supported trainers. When you decide to purchase an ErgVideo subscription for the full "video-reality" training experience, you really will use the very same software. Be sure to make use of our complete set of "how-to" videos to get up and running. Below are just a few that are specific to the free-mode features. Lots more here. email: click here to contact!